What is the Most Popular Type of Animal Milk in the World and Why? Some goats are bred for milk, which is drunk fresh or raw, although many recommend pasteurization to prevent growth of bacteria. 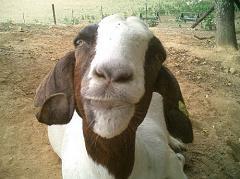 Goat’s milk can replace sheep’s milk or cow’s milk in diets for those who are allergic. Goat’s milk, however, has lactose like cow’s milk, and may cause gastrointestinal problems for people with lactose intolerance. In the West where cow milk is virtually the only milk consumed, it might surprise you to learn that more people in the world drink goat milk than any other kind. Human milk comes in at third place, especially among the younger set. Quite a few United States presidents kept goats at the White House, including Abraham Lincoln, Rutherford B. Hayes, Benjamin Harrison, and Harry Truman. What is the Difference between Whole Milk, Skim Milk, 2 Percent Milk, and 1 Percent Milk? How is Goat’s Milk Different From Cow’s Milk and Are Goats Harder to Milk than Cows? Where does Soy Milk come from and Why does Soy Milk boil over so easily?